One of the many charities Mary Lu supports is the Children’s Institute through her generous involvement with the Colleagues and C.H.I.P.S. support groups. 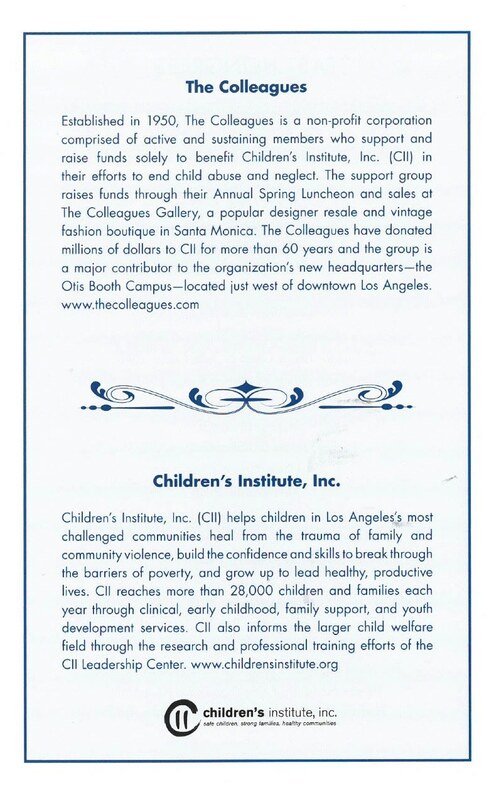 The Children’s Institute has been at the forefront in efforts to help children and families in our most challenged communities in Los Angeles to heal from the trauma of violence, build the skills and confidence to break through the barriers of poverty, and grow up to lead healthy and fulfilling. This past week, Mary Lu attended the Luncheon Event at which the Colleagues presented the “Champion of Children Award” to actor and philanthropist, Roma Downey. Ms. Downey gave a very moving and inspiring acceptance speech in which she suggested that if everyone treated each person they met with God-like kindness, the world would be a better and safer place. It was an edifying experience for all who attended.